By the time we went up to the forest, the day’s rain had stopped. 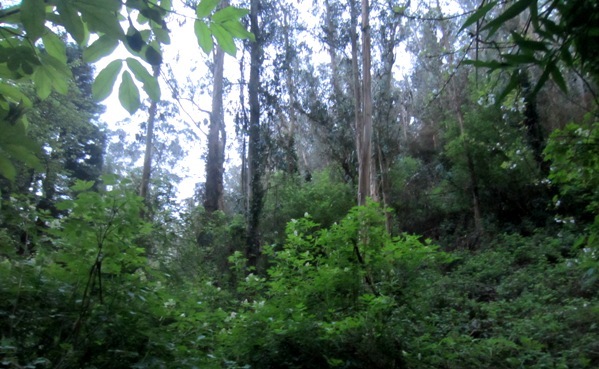 The world of Mount Sutro forest was fresh and green. The world of homes and automobiles fell away at the trailhead. It’s a wonderful time in the forest. The trails are damp but firm, with very few puddles. 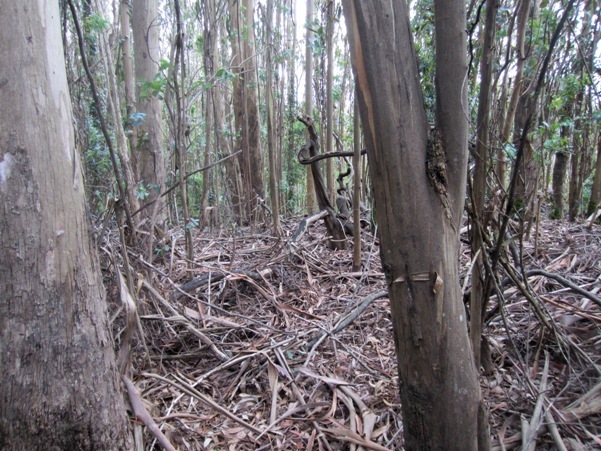 The understory seems to be growing back – we hope the Sutro Stewards are leaving it alone through the nesting season – and we heard birds throughout the forest. Not as many or as loud as there used to be even three years ago, but still enough to claim the forest. 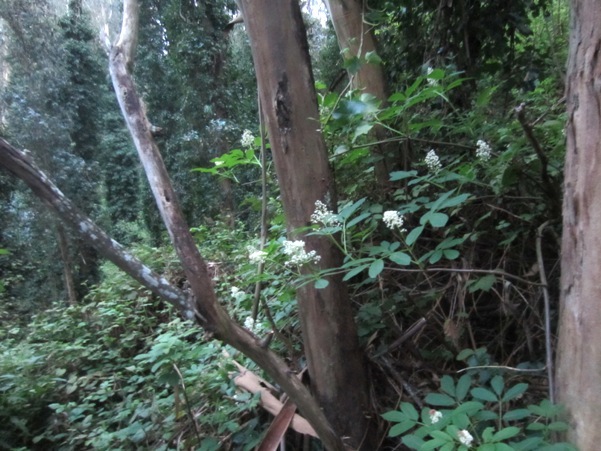 The understory was dotted with flowers: Society Garlic, elderberry, the occasional dandelion, lupine, and blackberry. Others we couldn’t name, though maybe someone will. The pink-flowering currant still drips its delicate flowers, but it’s nearing the end of its season. 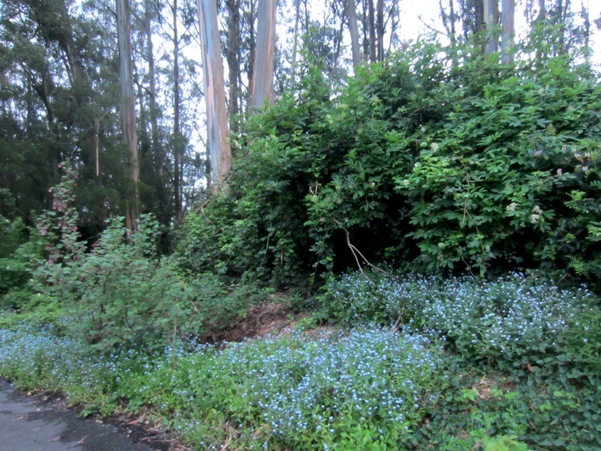 And the forget-me-nots are back along the paths – and especially at the top of Nike Rd, where they’d been mulched away two years ago. Even the Native Garden’s looking nice. 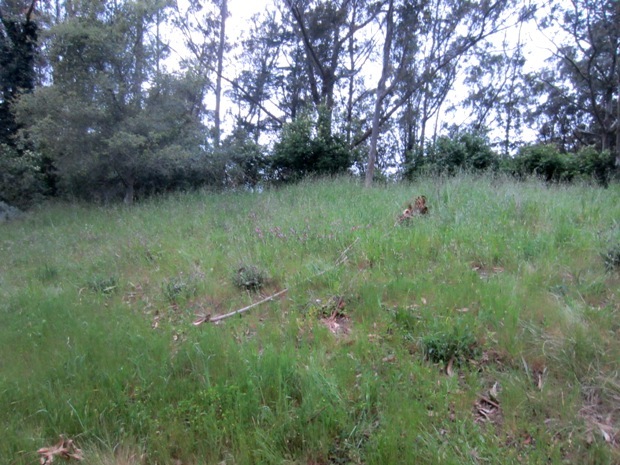 The rain has greened out the meadow sections, which are generally scraggly and dry nine months of the year. 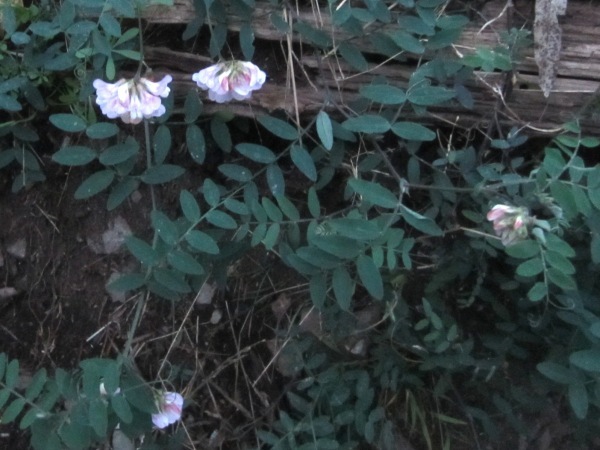 Though the pink-flowering currant is past its prime, some lupine is in bloom. 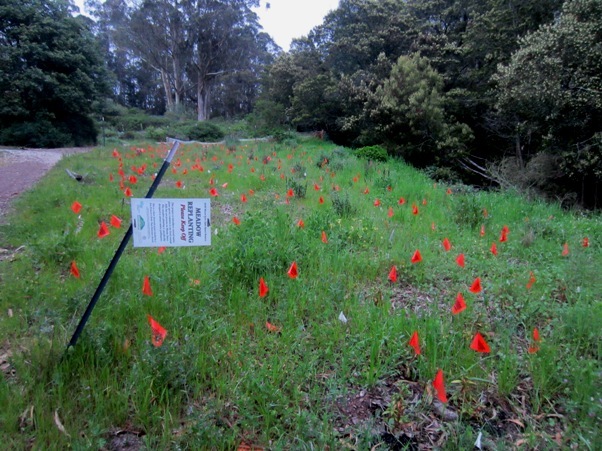 The replanted section is still growing bright orange plastic flags, but a few flowers have emerged among them. We’ll see if they attract native pollinators as intended. The plastic fencing around it is mostly gone, and it looks like they knocked the sign sideways in the process of removing it. But it’s not. 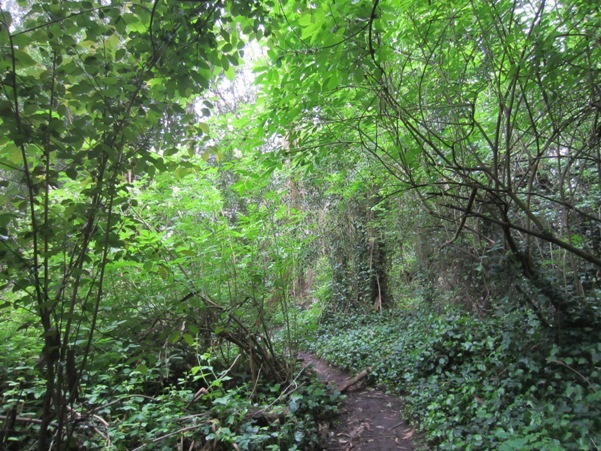 As long as the forest is left alone, a functional cloud forest, it does not get dry enough to ignite. Besides – we don’t think the Management Plan to cut down the trees, chip them, and leave them where they fall is likely to help. In the picture below, they haven’t (as far as we know) cut down any trees. 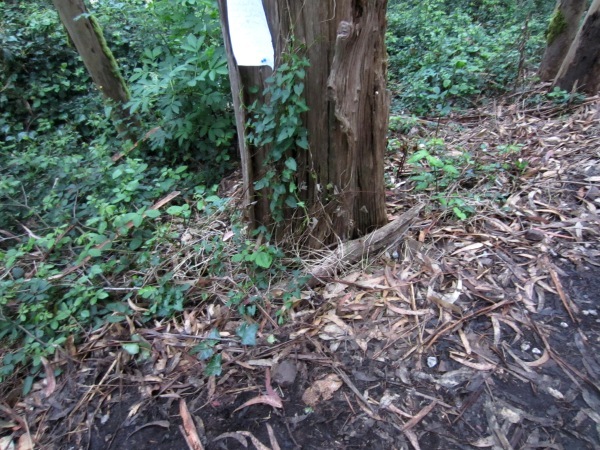 But they have ripped out the understory, and mulched the ground with branches and bark. That’s the look that the Management Plan seems to be going for, except that this picture still has too many trees. All but one or two trees in this picture would be chopped down, chopped up, and left on the ground. It would not be less flammable or safer than what’s there now. Already, there are a lot of orange blobs. 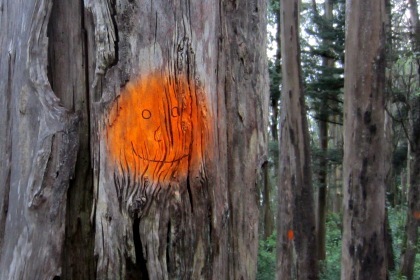 It seems that every trailside tree that isn’t perfect, anything that’s quirky or leaning or odd or dying, has been blobbed. But the note-writer, whoever it is, is right. Dead and dying trees are important as habitat. Insects find them easier to get to, and then birds like woodpeckers hunt the insects. Cavities develop and birds nest in them. 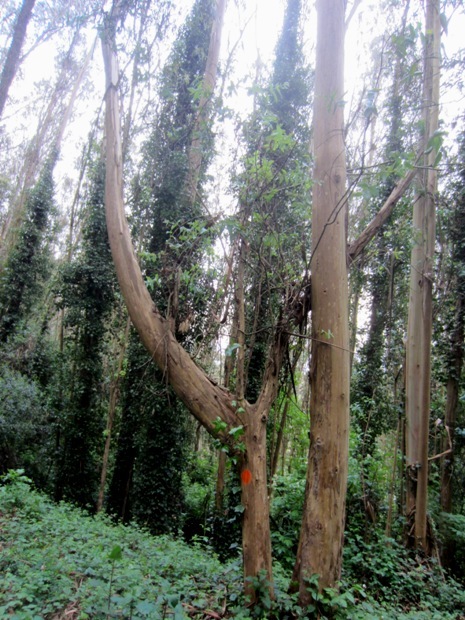 And the quirky trees – they’re part of the forest’s character. 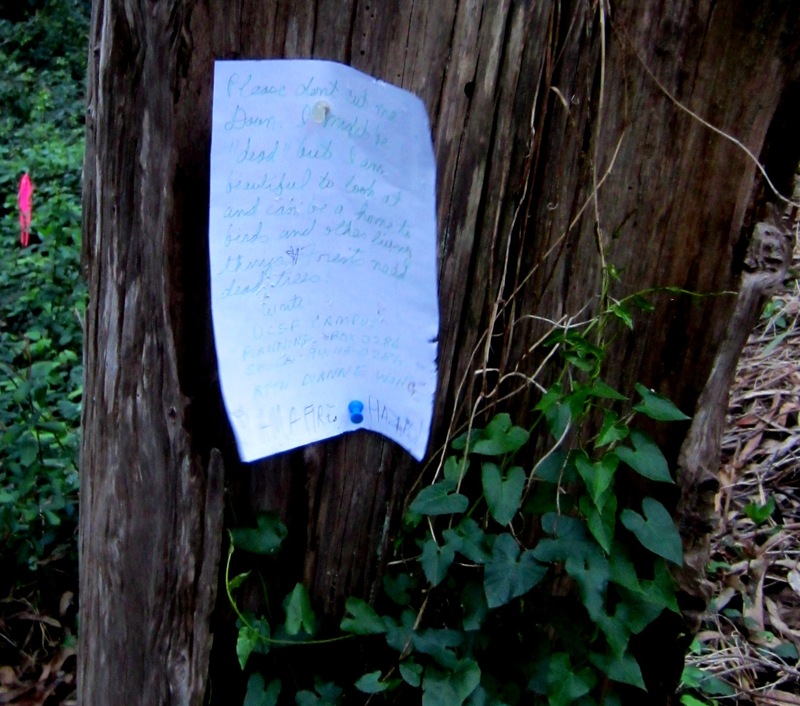 No one wants a forest that’s full of trees like lamp posts. 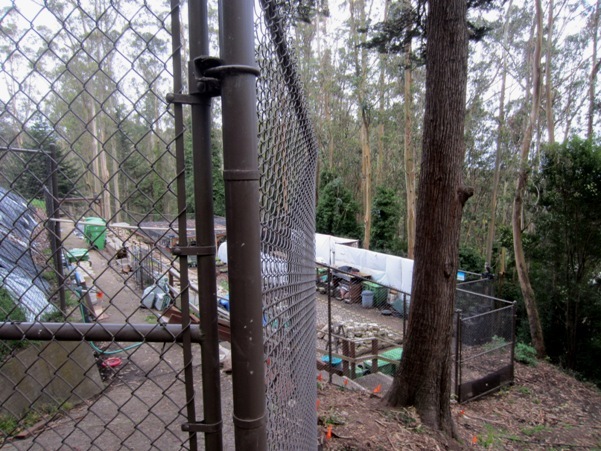 The Sutro Steward’s Nursery still isn’t blending in with the forest as UCSF promised neighbors; it’s looking more like a worksite. 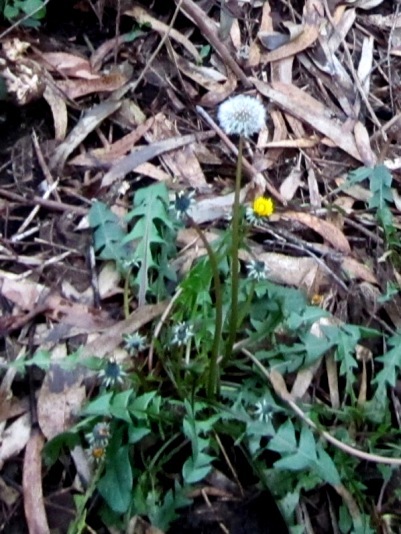 The picture below shows what it looks like at present. And if it reminds you of photographs of rain-forests and cloud forests – it does us, as well. 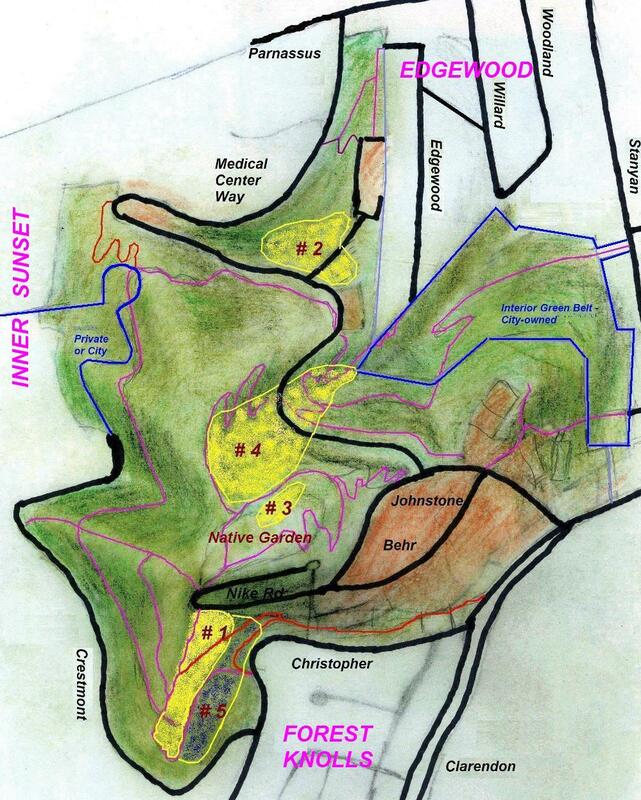 The “Demonstration Projects seem to have targeted some of the most beautiful and untamed parts of the forest. We hope we can stop this destructive Plan. 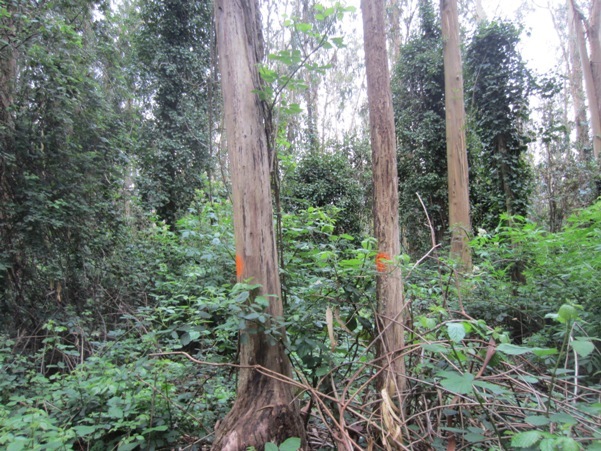 This entry was posted in Environment, Mount Sutro Stewards, Mt Sutro Cloud Forest, Mt Sutro landslide risk and tagged cloud forest, drying out the forest, environment, Sutro Forest, Sutro Stewards, trees. Bookmark the permalink. 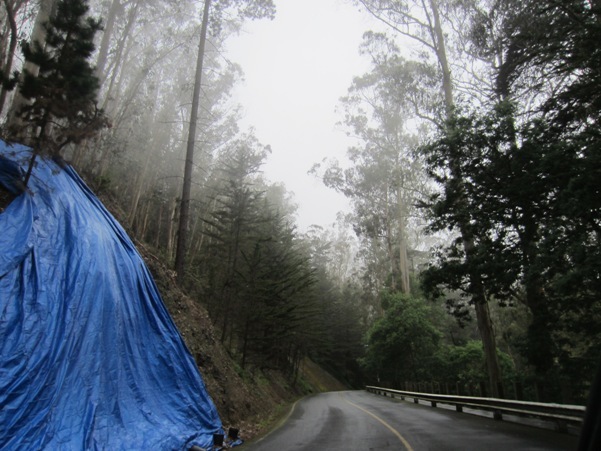 the blue tarp has been there for a few months. 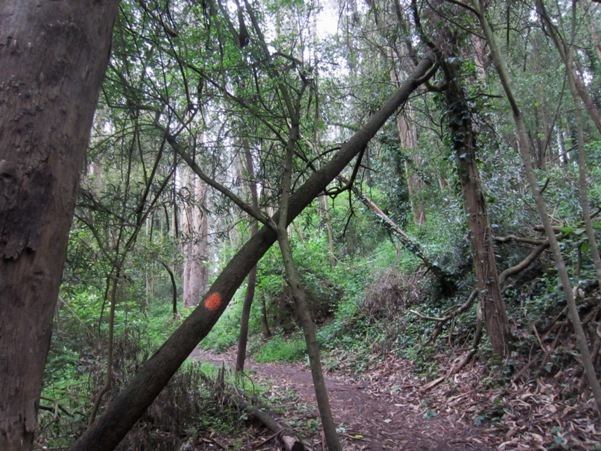 Look at the tree in the last picture that is hanging right over the trail. And behind it there is another, yet smaller tree hanging over the trail as well. It would be a shame if those were to fall and hit a slow moving hiker one day.